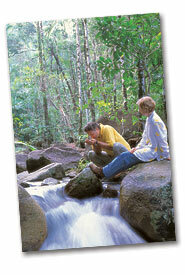 Eungella National Park is the longest, oldest stretch of subtropical rainforest in Australia. 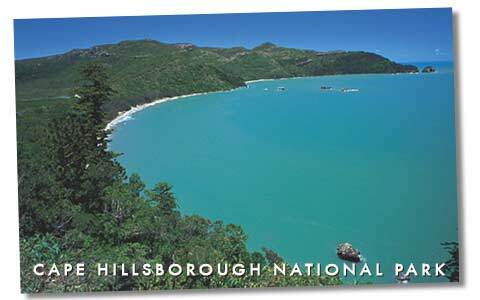 It is one of Queensland’s most popular national parks, covering over 51,700 hectares of rugged and unexplored land. Here you can spot the platypus in its natural environment from a viewing deck over Broken River- one of the only places in Australia you can easily do so. Eungella also has 225 bird species recorded including the Wompoo Pigeon, Crimson Rosella, Regent Bower Birds and the rare Eungella Honey Eater. To get there, drive east along Eungella Road, which will lead you through lush cane fields and small country towns that boast big pubs and famous meat pies. Notable features include the house that famous opera singer Dame Nellie Melba (Melba House) lived in whilst married to a local Sugar Mill Manager. Melba house also doubles as an information centre, as well as showcasing historical artefacts about Dame Nellie. The Mirani Museum boasts a host of information about the Aboriginal and South Sea Island culture and heritage, wartime records and Mackay history. Just after Mirani is the Illawong Fauna Sanctuary where you can hand feed kangaroos, wallabies, emus and even talk to the birds, but don’t forget, never smile at the crocodiles! The Sugar Bowl is a memorabilia shed of sugar bowl collections, farm tractors and machinery that date back to the 1938. The shop also hosts great country style gift ideas and a local craftwork outlet. Finch Hatton Gorge is where you can take a walk through the lush rainforest and find yourself at various fresh water swimming holes at the base of the spectacular Araluen and Wheel of Fire waterfalls. Or for those with the taste for adventure- Forest Flying is a trip on a flying fox through the rainforest canopy. Get a bird’s eye view over the rainforest and you could even find yourself amongst some noisy fruit bats! Camping and cabins are available at Finch Hatton Gorge for that back to nature escape. When you reach the top of the range, The Eungella Chalet offers friendly hospitality, an ice cold beer and great views over the Pioneer Valley and all the way to the coastline. 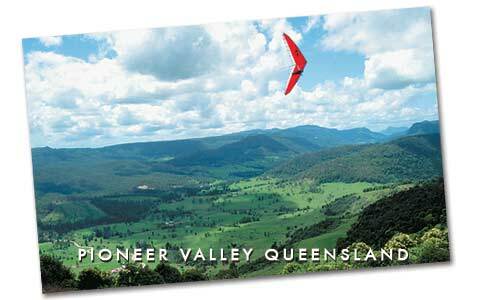 Eungella (pronounced young-galah) is an Aboriginal word meaning ‘land of the clouds’. Eungella National Park has 25 kilometres of walking trails through a magnificent high country mix of tropical and temperate rainforests. The walks range in length and difficulty from a 300m wheelchair accessible walk to 17 kilometre round trip journey, taking in the best rainforest and mountain views. A kiosk with refreshments, local information, and public amenities can be found at Broken River, 5 km further on from the Eungella Township. This is the area where you can spot the platypus in its natural environment- the best times being on dawn and dusk. Enjoy a coffee and gourmet sandwich with home-made bread in the surrounds of the rainforest. Or for a relaxing, nature-based experience, stay a night or two at Broken River Mountain Retreat where you can join eco night spotting tours of the National Park. When you stay at the historic Eungella Chalet- wake up to a magnificent sunrise and stunning views across the Pioneer Valley.